Initially most magazines followed a basic business model with the majority of income derived from advertising, subscriptions and newsstand sales. A combination of developing technology plus a slump in advertising sales meant titles either had to evolve to secure additional revenue streams or close. The result was the birth of the ‘brand’ followed by brand extensions. Before an extension can be established the brand has to be defined. But what makes a magazine a brand? Mostly it’s about consistency and trust. It is a combination of a concept, promise or benefit, strong house-style and consistency across all its associated products. To gain, engage and keep an audience, readers not only have to like a product, but trust it too. Readership trust takes time to establish. It is achieved by defining and sticking to core brand values. For example a writing magazine might seek to avoid vanity publishing or self-publishing companies which have a poor reputation. Publishers will seek to align themselves with strategic partners who also hold similar values and have a good reputation. Content and visualization also play a part as branding is also reflected in the look and feel of the publication. This is achieved through developing a strong house-style and clear editorial voice, which is then reflected across its associated media. A magazine should stand out among its competitors on the newsstand by having a distinct identity through visual imagery and content. There must also be a perceived value in terms of content. Great brand extensions will have a synergy that enhances the title. This might be a sister magazine which Cosmopolitan, Hello and Woman & Home have all successfully achieved. Alternatively it could take the form of a product, event or service. Extensions evolved from every sector – be it lifestyle or specialist to B2B. Initially these were simple additions such as a sister title, websites or digital products to enhance the publication as well as engage the reader. More recently publishers have moved into events, education, awards and merchandise. In the consumer sector a good example of successful multiple brand extensions is Cosmopolitan, published by Hearst. It has developed additional magazines as well as a range of other income streams. According to Cosmopolitan’s media kit, Cosmopolitan has published 15 e-books, and produces highly successful spin-offs such as Body, Fashion and Cosmo on Campus which is distributed to a quarter of a million students each term. The brand is consistently ranked as the UK’s number 1 top grossing brand in the Apple Newsstand for iPhone sales – showing a rapidly growing demand for Cosmopolitan through emerging digital channels. Our highly successful events – careers masterclasses, fashion catwalks, the Ultimate Women of the Year Awards and the Blog Awards – take Cosmo off the page or screen and into readers’ lives. Wherever the Cosmo woman is, so are we – and no brand knows her better. But do these work? And has Hearst’s extension strategy engaged more readers? Not really if taking circulation into consideration. Despite seemingly knowing its audience, Cosmopolitan’s 2014 circulation was down to 289,044. That’s 3.7% on the previous year according to a report in UK magazine figures in the Press Gazette. In this sector magazines have a somewhat stronger hold over their audiences, thus it could be argued that these brand extensions could be more valuable in terms of revenue. Drapers, the industry magazine for fashion, was established more than 125 years ago. Today, according to its media kit it has a print circulation of 8,671 and a readership of 43,500. Despite a small circulation this is a viable title as like many B2B publications it derives a reasonable income from copy sales and subscriptions. Why? Because the information it publishes is of high value to its audience of fashion retailers. Among its portfolio are conferences and awards, which the media kit describes as having: having grown to become the benchmark for the nation’s leading fashion brands and retailers. Attracting the most influential industry figures, they offer an unparalleled opportunity for businesses to network and raise their profile among senior decision makers. A recent edition to the Drapers’ portfolio is its clubs such as Drapers Inner Circle. The key to Drapers’ sustainability it would seem is to create exclusivity therefore giving their readers perceived value. 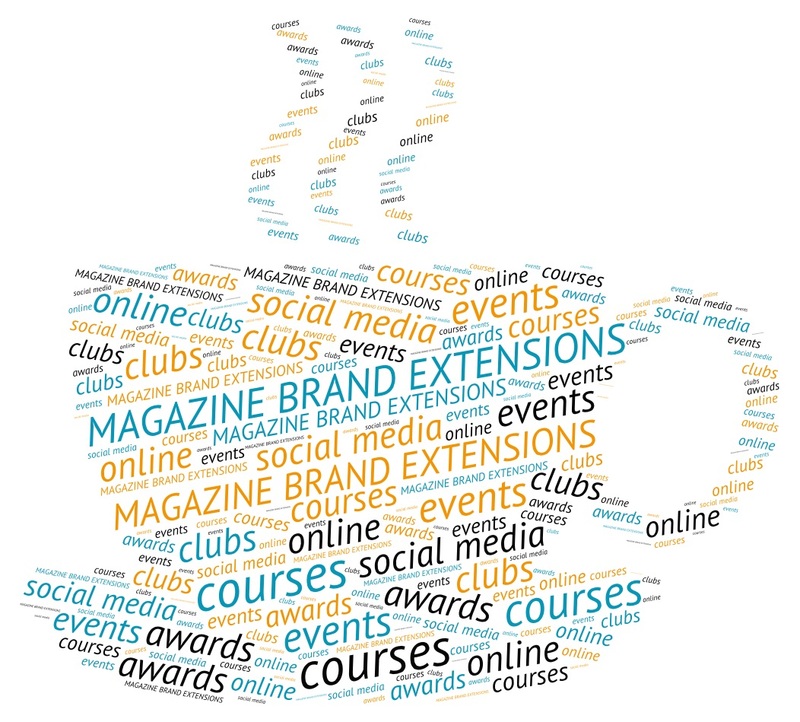 When compared to a specialist title such as Writing Magazine, published by Warners Group, which is aimed at professionals and amateur writers it is interesting to note the variation in brand extensions. According to its media kit, Writing Magazine has a slightly larger circulation of 23,000 for the print edition. That’s nearly three times that of Drapers. Again it’s the value perception element. Although full of great content that will no doubt help any amateur writer get published, Writing Magazine doesn’t hold quite the same priority for its readers. Why? Because it is unlikely to add to their wealth on a large scale. But the title knows how to engage its readers and more importantly had identified what readers need. Hence aside from the usual portfolio of online and social media, it has developed extensions based around its readers’ needs. These include writing competitions, courses and an online bookstore – which seeks to help its audience achieve their dreams. Yes, but only if carefully developed around readers’ needs. Like content it is about understanding and engaging your audience. If you can tap into a need, then that publication is more likely to be sustainable in the long term with strong income streams that don’t rely solely on copy sales or advertising. 1. Define what your readers want. 2. Now consider what they might need. 3. How can you facilitate this? 5. Identify ways to make it profitable. This entry was posted in Revenue streams and tagged Brand extensions; revenue streams; magazine revenue; magazine audience engagement; targeting magazine audiences;. Bookmark the permalink.